After finishing up the Camber Cardigan, I was bit by the cast-on bug. I initially decided I wouldn’t let myself cast anything on until I finished the Summer Breeze Vesper socks, but since I didn’t have much on the needles, I cast on for Ishbel in Handmaiden Sea Silk to bring to the Spring Fling with me. I did work on it a little bit while at the Fling, though since I’ve been home it hasn’t seen much progress. 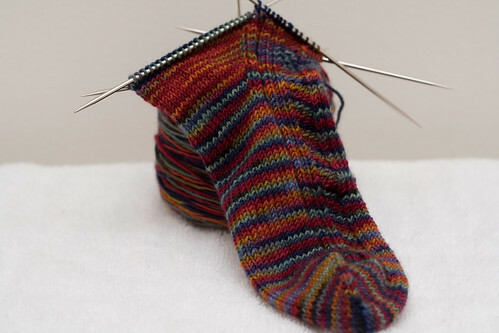 While I was at the Fling, I finished up the Summer Breeze socks, so I decided to cast on my Spring Fling socks. A number of people going to the Fling decided to all knit Vesper socks and take a picture at the Fling, so I decided to use Damsel for mine. 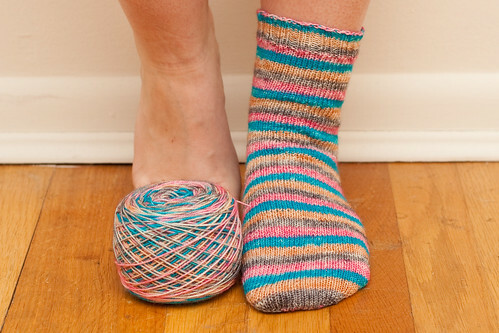 By the time I got home after the Fling, I had one sock finished. 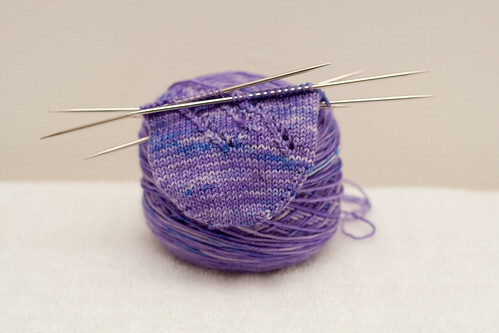 Just before the Fling, I started another sock. I thought it would be good to have something with a little bit of a pattern that was interesting, but simple enough to work on while socializing. I decided on doing the toe-up version of Ampersand using Socks That Rock Lightweight in Farmhouse. I didn’t end up working on it much while at the Fling, but I’ve made it up past the heel and onto the leg (the photo below shows just before I turned the heel). After getting back from the Fling, I worked on this sock while figuring out the details for another project I’m working on. The big project I’m working on right now and the one that has been getting all my attention is a modified version of the Tempest cardigan. Recently Adrienne (in my knit group) knit Tempest in three colors of Wollmeise and I really like how it turned out. It had been in my queue for a long time, so I decided I needed to make this sweater. I kept trying to decide on three colors of Wollmeise to use, but didn’t think any of the colors I had really went together that well. I had two skeins of Bugga in Faithful Beauty in my stash (which I bought thinking I’d make a shrug or shawl with it), then I caught a Bugga update and got two skeins of Ruby-Tailed Wasp. 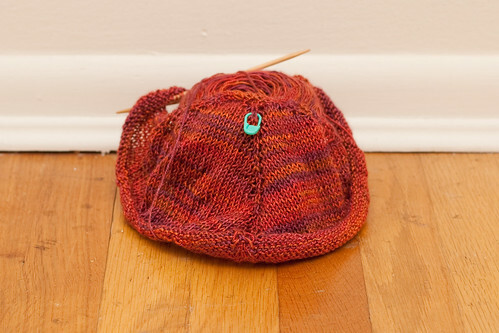 Once I got the colors together, I knew I had to make Tempest with this yarn. I had the yarn just before the Spring Fling, so I decided I wanted to wait until I took Jared’s sweater class before casting on since there were a few things about Tempest I wasn’t totally in love with: the neckline, that it is knit in pieces and sewn together, and that it didn’t have much of a border/edging. After an excellent class with Jared where I learned a lot about sweaters, I decided to use the striping pattern of Tempest, go with a gauge I liked that is slightly different then the pattern, add a garter stitch edge to the bottom, change the neckline to be a v-neck shape, and knit it in one piece. I started it on May 1st and it’s been the only thing I’ve worked on. I really love working with this yarn and these colors! It’s been exciting to figure it all out and see it coming together. I’m up to the yoke now and I think I’ll be done with the body of it this week. After the body is done, I’ll do the button band, then the sleeves. Now that the sweater is getting too big to be portable and I’ve been wanting to jump back in the Socks from the Toe Up KAL, I decided to cast on the Labyrinth socks Monday. I’m using Bigmouth Yarns Buxom Sock in “You’re Turning Violet, Violet”, which is a sock club colorway from the Willy Wonka Sock Club. I like how it’s working up in this yarn. It really shows the pattern well. Even though I’ve got a number of projects on the needles, I’m already thinking about what I’m going to knit once I finish up Tempest. I bought a number of sleeveless summer dresses recently, so I’ve been looking at patterns for shrugs and cropped cardigans. 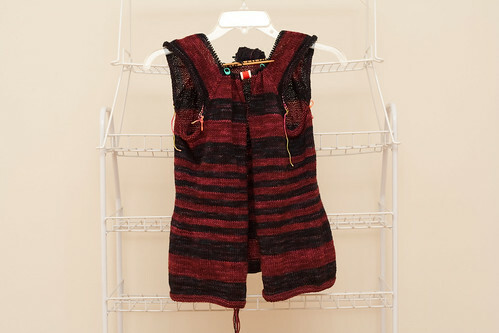 What’s your favorite shrug or cropped cardigan pattern? I’m still undecided on what to knit that will be versatile and go with at least a few of my dresses. I’ll likely need yarn, too, since I don’t have any colors that would match well with any of the dresses I have. What’s your favorite summer yarn? I’m thinking maybe cotton or a cotton blend. I don’t want anything keeping me too warm during the already hot summer months! Oh, I am SO jealous about KY Sheep and Wool… I was supposed to be driving up there this weekend (from SC, if you can believe it), but my friend cancelled. 😦 Tell me all about it, so I can live vicariously! !